We've got an early "Love 'Em Leave 'Em" this week, coming in before Thursday Night Football. The Seahawks face the Cardinals tonight. The rest of the week offers some pretty exciting games, including the Saints against the Bills. the Cowboys against the Falcons, and the Vikings against the Redskins. Let's get into Week 10's starts and sits. Love 'Em: Jared Goff vs. HOU - The Texans know how to stuff the run, but not so much the pass. They've allowed the 4th most points to opposing QB's this year. Since Week 4 against the Titans, every QB they've faced has attempted at least 30 passes. Goff doesn't throw unless he needs to, completing only 14 passes in the 51 point victory over the Giants. However, he's really good when he does, averaging over 15 yards per completion over the past 2 games. The bottom line is that Goff is a top-6 option for Week 10. Leave 'Em: Phillip Rivers @ JAX - Jacksonville is the toughest defense to play as a quarterback against by a significant margin. Opposing quarterbacks aren't even averaging 7 points per game against them! Rivers also isn't exactly killing it this year, scoring over 20 points just once this year. Do yourself a favor and go find a quarterback on waivers. 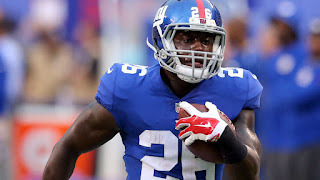 Love 'Em: Orleans Darkwa @ SF - Orleans Darkwa has been in some pretty unfortunate situations this year, but has managed to not have any terrible games. He had a great matchup against the LA Rams last week, but they were playing from behind and they attempted nearly 40 passes. The game before that he played Seattle. He's started four games, and the G-Men haven't been trailing in two of them. In those two games, he scored 28 PPR points. The odds that the Giants get blown out by San Francisco are extremely thin, and the 49ers can't stop the run to save their lives. Darkwa is a top-15 option this week. Leave 'Em: Adrian Peterson vs. SEA - This was written before Thursday Night Football, so I might as well use it. There's good Adrian Peterson and there's bad Adrian Peterson. Good Adrian Peterson showed up against the Bucs and the 49ers, rushing 63 (!!!) times for 293 yards. Bad Adrian Peterson showed up against the Rams, rushing 11 times for 21 yards. The Seahawks are, without question, his toughest test yet. He's 32 years old with lots of surgeries in his past playing on a short week. No thanks. Love 'Em: Devin Funchess vs. MIA - Funchess had a pretty good game last week, catching 5 balls for 86 yards. He's pretty much Carolina's only receiver without Kelvin Benjamin, and should see even more targets with McCaffrey seeing more carries. He gets Miami this week, who have allowed a score to a receiver in each of their last 4 games. Funchess is due for a score with only one touchdown in his last 5 games. If I had to bet, I'd say Funchess goes for 75 yards and a touchdown. Leave 'Em: TY Hilton vs. PIT - Hilton is like Adrian Peterson; he's either really good or really bad. To put this in perspective, he's either giving you less than 10 points or over 25 points. Only Jacksonville is a tougher matchup than Pittsburgh, and Hilton only caught 2 passes against the Jaguars. He was also recently added to the injury report with a groin injury. Stay away from Hilton and the entire Indianapolis offense this week. Love 'Em: Kyle Rudolph @ WAS - Rudolph has been playing well as of late, averaging over 12.5 fantasy points per game the last 4 weeks. He's definitely building a connection with Case Keenum after struggling the first couple weeks he was in. Washington struggles against TE's, giving up the 4th most fantasy points per game to TE's in 2017 and allowing a touchdown to the opposing TE in two of the past three weeks. Rudolph's an elite play this week, especially with guys like Kelce and Ertz on byes. Leave 'Em: Julius Thomas @ CAR - Thomas has been fairing well the past couple weeks, going over 50 yards in 2 of his last 3 games and catching a touchdown last week. Don't count on it this week, though. Carolina is allowing the 8th fewest fantasy points per game to tight ends, and as a whole are a very strong unit. We've seen how Miami does against tough defenses (Baltimore) already this year. I expect them to fall back into that form this week. Avoid Thomas no matter how bad you need a TE.